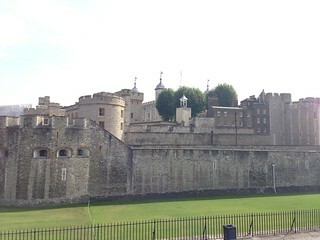 Tuesday in London began with a trip to the Tower of London. One of my misconceptions was already dispelled by seeing it on Sunday: I had thought that the Tower of London would be much taller in proportion to its width. 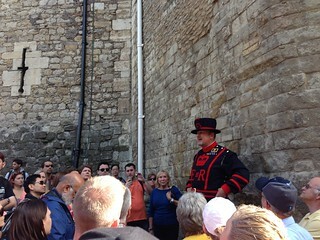 One of the particularly fascinating bits of the Tower of London was the Beefeaters themselves. They are members of the armed forces, only eligible to become Beefeaters after twenty-two years of distinguished service. (There’s a lot of competition for the positions, also - our guide mentioned that there were 80 candidates applying for the most recent position.) So this guy who gave us our tour probably served in Afghanistan or Iraq in Bosnia (presumably in a different uniform). And if his service was more than usually distinguished, there’s a good chance that he saw combat then. It must be quite a transition to go from a life of combat-readiness to a life of guiding tours. 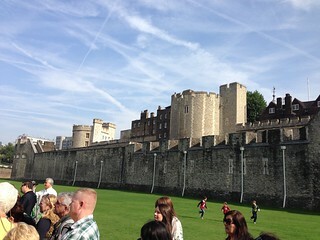 We took the extra tour to see the Crown Jewels, and it was well worth it. The United States really has nothing like them (which might be a virtue). They are well-presented, with a lot of historical context - and a moving walkway to keep people from gawking too long. 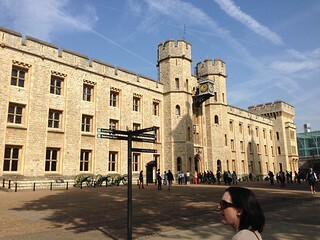 Since they didn’t allow pictures, we ended up buying a book about the Crown Jewels. As we were preparing to leave, we happened across an interactive drama happening in one corner of the Tower Grounds. A counterfeiter was being investigated, and eventually convicted and hanged. I’ve forgotten the name of the counterfeiter, but the Warden of the Mint who was investigating the crime was someone I’d heard of: Isaac Newton. 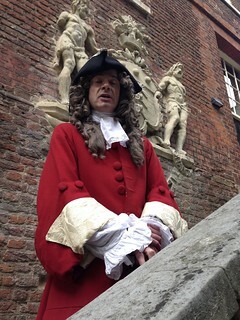 Apparently he was given the job as a sinecure after his advances in physics - but he took the job very seriously and did an excellent job, including the Great Recoinage of 1696. 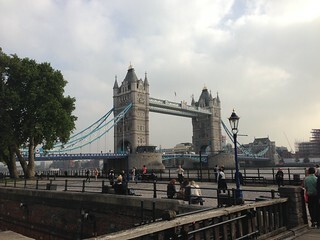 In retrospect, it should have been obvious: the Tower Bridge is so named because it’s close to the Tower of London. 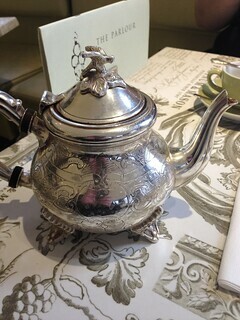 Tea at the Parlour was fairly nice, but the circumstances made it very easy to find fault. Service was really extremely slow and indifferent. 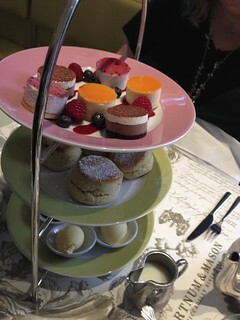 And the only option for an afternoon tea came with mini ice cream cakes - which meant that you couldn’t linger without the ice cream cakes getting melty. The whole experience made us extremely cranky. The Empress was a lovely dining experience. Our first sign that this was something special came when we were ordering. Lori ordered a korma (because she is very spice-averse) and the waiter murmured “that’s not very authentic”. Some diners might find this annoying. I can well believe that I would find it annoying sometimes. But for us then, it was a lovely thing to have a waiter who would make strong recommendations about the food. We got into a lengthy conversation with the waiter, and we followed his recommendations, and we had a great time. After some discussion about whether the “exotic spices” mentioned in the description would be too fierce for Lori, she settled on the Murgh Banarashi, a dish that I’ve never heard of in the USA. The most recognizable taste was pineapple, but there were a bunch of spices that I couldn’t identify. 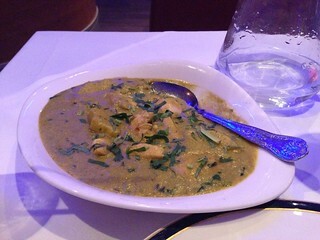 It was really tasty, though, with clear bright flavors - one of Lori’s favorite Indian restaurant experiences. 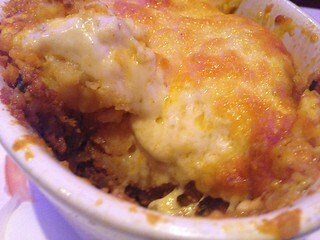 I haven’t read a reference to an Indian shepherd’s pie, but I think I achieved my goal. It was a shepherd’s pie, with sauced ground lamb and peas topped with mashed potatoes and cheese, but it was all seasoned with Indian flavors and it was really tasty. Between dinner and dessert, they brought us plastic tubes that were warm to the touch. We asked what they were: they contained heated moist towels for our hands. How refreshing! We had a good conversation with the waiter about where he was from and what foods he missed from home. Sadly, although I remember that he was from Bangladesh, I don’t remember what foods he missed. I do remember that we chose our dessert because he said that it was a particular favorite of his. 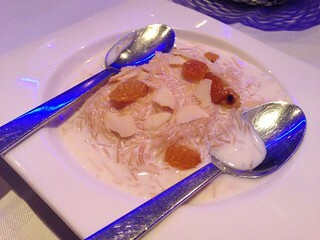 The dessert was shemai, another dish I’ve never encountered in the USA; the description said “Traditional Bengali dessert made with vermicelli, ghee, raisins, milk, sugar, and nuts”. 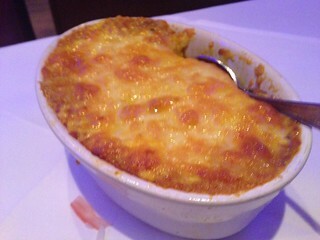 My best analogy is that it was like a rice pudding thinned with milk and cream - it was very tasty. The menu of after-dinner drinks includes Chili Naga Vodka. “Drink at your own risk; very very hot.” I didn’t try it. We had a splendid time at The Empress. 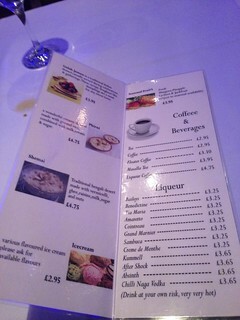 It was one of the best meals we had in London, and one of the best Indian meals we’ve had.